The Mane is part of the Arabian megaconstellation of the Lion (al-asad). In the context of the other elements of the Lion, the two stars of the Mane mark the rear edge of the mane. This pair was also called the Two Ribs (al-kharatan), alternatively translated as the Two Piercings, the places along the side of a lion’s body where it would be speared. The Mane (az-zubra) as it appears in the west about 45 minutes before sunrise in early March. A pair of bright stars that follows right after the Forehead (al-jabha). The Mane does not figure in the calendar of the rains stars. 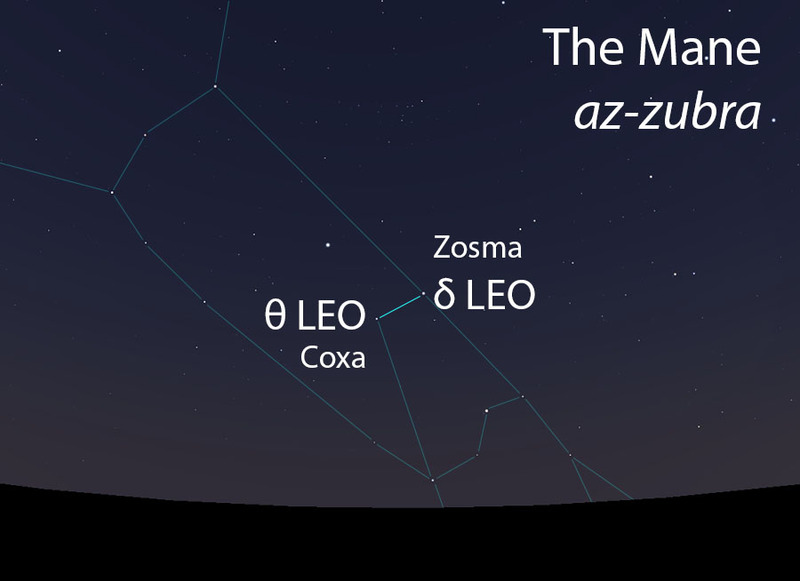 In early listings of the lunar stations, the Mane is the 13th station of the year. This was later changed to the 11th lunar station after the stations were adjusted to begin with the vernal equinox. The stars of the Mane match the Hindu nakshatra called Purva Phalguni. The Mane is part of the Lion (al-asad, الأسد) folkloric celestial complex, which extends from the Two Forearms (adh-dhira’an, الذراعان) to the Two Shanks (as-saqan, الساقان).